Preheat oven to 180°C / 350°F. Line cupcake pan with 20 liners. In the bowl of a mixer, combine the sugar, flour, cocoa, baking soda, baking powder and salt. Stir to combine. Add the eggs, milk, oil and vanilla, and beat on medium for one minute. Slowly pour in water, while the mixer in on low speed. Pour the batter into the cake tin and bake for 20 mins or until a skewer comes out clean. Cool the cupcakes in the pan for 10 minutes. Remove and cool completely on a wire rack before icing. Melt cream and chocolate in the microwave for 30 seconds. Stir to dissolve and heat again if necessary. Allow to cool for 10-15 minutes. Add the icing sugar, one cup at a time, until well combined. Stir in the white chocolate mixture. Christmas is just around the corner, but the baking has already begun. 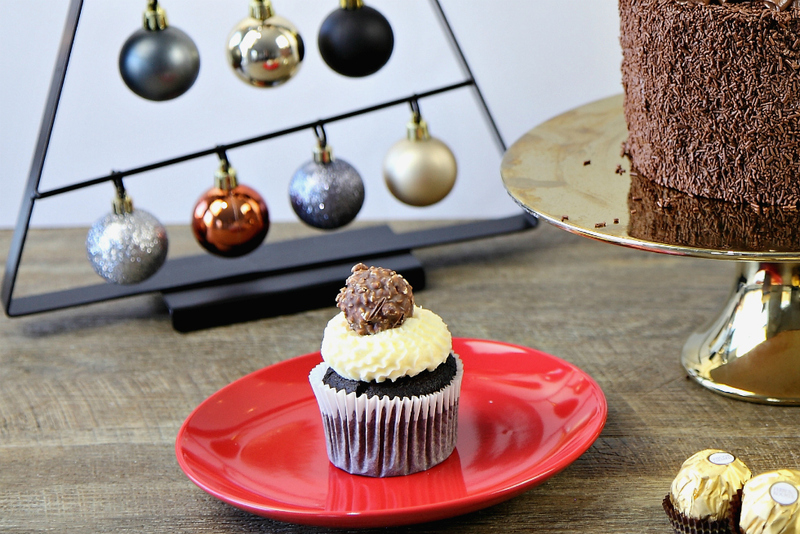 If you love a fluffy chocolate cupcake (or two), this is the recipe for you. These are a snap to make, and they are always gone too fast in our house.